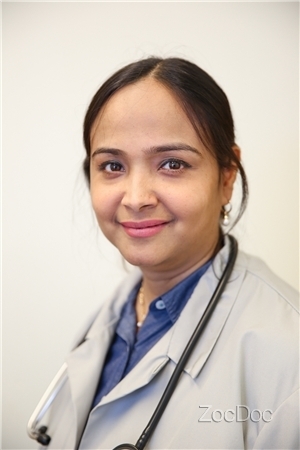 Practicing at Presence Medical Group - Family Medicine, Dr. Humera Khan dutifully looks after the locality of Evanston, IL. Dr. Khan is a capable family physician, board-certified by the American Board of Family Medicine. She is affiliated with Presence Saint Francis Hospital. Dr. Khan earned her medical degree from the Deccan College of Medical Sciences in India. She then moved to the United States, where she completed her residency at the Swedish Covenant Hospital in Chicago, IL. Dr. Khan is fluent in English, Hindi, and Urdu, which makes her accessible to patients from a variety of cultural backgrounds. Dr. Khan believes that two-way communication is the key to good health. She is a patient-focused provider who emphasizes on building relationships with her patients and works towards creating a personalized treatment plan. First, ZocDoc should refine its search algorithms. I searched for a pediatrician and it returned a family physician with specialties in dietary health and wellness. Those are not the same thing. Shame on me for not catching that. Second, Dr.Kahn and her team were unorganized and burdened us with immense amounts of paperwork. I was under the impression that completing all of the information on ZocDoc ahead of time would save me time at the office, but that was not the case. Third, there nursing team was slow and inefficient. We saw only one other patient come through the office in our time there, yet our first child was seen 30 minutes late and our second child was seen 45 minutes late. Then, Dr. Kahn did not come see the kids until over an hour after our appointment time and that is only after we went to find her. Her excuse was that her nursing team did not tell her that we were ready. I will never take my children to this practice again and would advise anyone looking into this practice to do their research. It was easy to book the service online, someone got back to me right away, they made sure my insurance would cover my visit and there was no waiting, my doctor spent quite a bit of time with me, I did not feel like another number... will return. Great doctor, eased my nerves as I had not been to a doctor in several years! Dr. Humera Khan, MD has no appointments on Zocdoc right now.